The behemoth lecture hall 1100 Social Sciences filled up fast, students piling through the doors. A few latecomers rushed in and took seats on the floor as a white-haired professor with a proper English accent pointed out a student in the crowd. Yes, the student answered to each question. Mother and daughter dentist duo Jeanne and Kelly Brewer remember the first time they ever worked together. One of Jeanne’s patients needed to have a root canal over a weekend, and with no dental assistants available to help with the procedure, Jeanne offered the job to her daughter, Kelly. Kelly was seven years old. “When you’re doing root canal work the person who’s assisting you suctions next to you. She wanted to make sure it was at a perfect angle, and she sat there just doing it perfectly because that was her big job. She was great,” Jeanne said. Leafing through a giant portfolio filled with photos of her many designs, couture fashion designer and historical film costume researcher Elizabeth Galindo can remember exactly how she designed, sewed, and accessorized every one of her signature gowns. After more than 20 years in the business, that’s a lot of dresses. These days, Galindo has been a fixture on the UC Davis campus as she studies for her Ph.D. and, most recently, designed the costumes for the upcoming Theater and Dance Department production ofGallathea. It took Steve Wampler 20,000 pull-ups to reach the top of El Capitan. Over the course of six days in August 2010, Wampler used a self-designed pulley system to hoist himself up the 3,000-foot Yosemite rock formation, becoming the first person with cerebral palsy to complete the daunting climb. “[By the end] I was so exhausted and dehydrated and I lost 10 pounds and I was happy it was over, but I really didn’t take it in until a couple days later,” said Wampler, who graduated from UC Davis in 1992 with a degree in environmental engineering. Though it took a few days for Wampler to process his achievement, news of the climb quickly caught the attention of the likes of “Ellen DeGeneres”, “ABC World News with Diane Sawyer” and now, Sports Illustrated. Upon walking into the nearly-empty ASUCD Coffee House at 8:15 a.m., it takes approximately 30 seconds for John Ortiz-Hutson to begin waving friendly “hellos” to colleagues and friends. For the past 23 years, Ortiz-Hutson has indeed been a fixture on the UC Davis campus, first as a senior learning skills officer at the Student Academic Success Center and then as the student affairs officer of the African American and African studies program. He will officially retire this week, culminating in a career that has allowed him to mentor and advise hundreds of students, as well as collaborate with dozens of campus departments. Television news anchor and reporter Brad Hicks has UC Davis to thank for his first on-camera job. Hicks had earned his bachelor’s and master’s degrees in geography from UC Davis in 1986 and ‘88, respectively, and was coming off a stint at Texas A&M University as a Ph.D. student when he applied for a job at WGAL-TV in Pennsylvania anchoring the local farm report. A native of Palo Alto, Calif., Hicks had little knowledge of agriculture. But, no matter. For Rocky Twitchell, every building at UC Davis has a number. The Robert and Margrit Mondavi Center is 125, for example. Chemistry Annex? More than 200. Giedt Hall, a particular favorite of Twitchell’s, is a merciful four. “Meyer has way too many,” he says emphatically driving past the rectangular hall on a busy Friday afternoon. 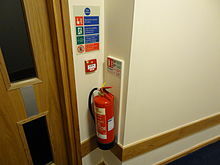 He’s no mathematician, but there is a common denominator in this numerical puzzle: fire extinguishers.